PowerPuff scrubbers have returned! 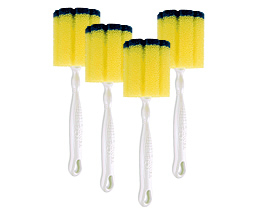 Set of 4 PowerPuff scrubbers with the blue scourer on the bottom. New wider size (2.75" wide) is great for cups, mugs, carafes and more. Patented design scrubs sides while scouring the bottom clean. Long handle is great for reaching deep inside. Overall height is 10". Specially formulated scrubbing material easily rinses clean and does not promote the growth of bacteria. Environmentally friendly plastic handle is made from recycled milk jugs.